Wayne resident, St. Mary’s Presbyterian church member and Main Line college student Missy Pearson has agreed to take AroundMainLine.com abroad for not one, but two semesters! Pearson is a Loyola University (MD) junior and is participating in her university’s oldest study abroad program at Katholieke Universiteit in Leuven, Belgium. Missy wrote to us the other day and is excited to experience Europe during the holiday season but is looking forward to coming home and sleeping in her own bed, in good ’ole Wayne. And, Missy, we don’t blame you. But, in the interim we can all continue to live vicariously through your sensational semester abroad. Ahh…to be young again with the world at your fingertips! Missy, we will catch up with you one-on-one upon your return and wish you a Happy Thanksgiving. Dank u wel! I realized the other day that in all my write-ups about my travels outside of Belgium (since I arrived here over two months ago), I’ve failed to write about my home base — Leuven. A large part of my childhood was spent in the heart of the Main Line in Wayne; it was amazing to travel thousands of miles to another country and discover another small town that felt just like home. Leuven is about 30 minutes west of Brussels. A large university town, the city is lined with cafes and faculty bars. The streets are taken over by bicycles—in fact, just a couple weeks ago I was pulled over on my bike and threatened with a 75 euro fine for going the wrong way on a one-way street…they take bikes very seriously here! Perhaps the most well-known part of Leuven is the Oude Market, which takes pride in the claim that it is the longest bar in Europe. 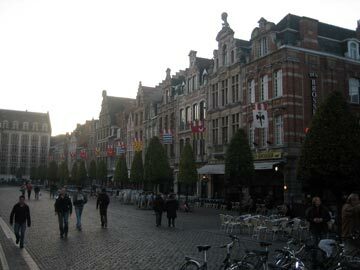 The Market Square is a popular hangout for the students of Katholieke Universiteit, the largest Belgian university and the oldest Catholic university in the world. Aside from the occasional night out, I’ve nestled in to my ‘home away from home’ in the Loyola College residence. The state-of-the-art building is home to 13 American students and about 60 Belgian and other international students. Living in the house with this diverse group has been such a positive experience. I’ve grown close with my roommate from Spain, as well as many of the Belgians. Living in close quarters with students from all walks of life and, literally, all corners of the globe, has made me realize just how similar we all are. I’m looking forward to all the parties, dinners and fantastic adventures that are still to come! People who know me back at home know that when it comes to doing work, reading, or relaxing, I enjoy doing so in a coffee shop. In Wayne, I favor the popular Starbucks. In Baltimore, it’s the Evergreen Café. But, my European coffee shop of choice in Leuven…is, well, undecided. It’s a toss-up between Dwerf and De Dry Coppen. Dwerf is a funky café and restaurant known for having tables outside with blankets for cooler days and (my personal favorite) warm milk with chunks of dark chocolate you mix in yourself (resulting in the most delicious hot chocolate). But De Dry Coppen offers some serious competition — the French Vanilla Latte is like none other and the ambiance reminds me of my favorite book shop in South Carolina. The walls are lined with classic novels mixed with travel books, and best of all, there is an entire section of English-print books. It’s certainly nice to know that I’ve found two places to escape to when it is crunch time during exams and I’ve got to hit the books. 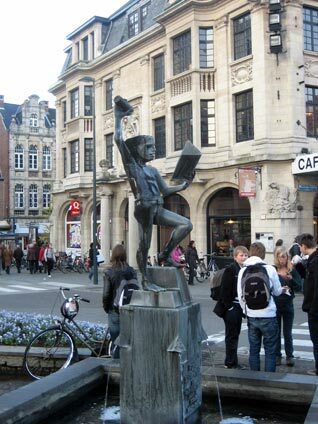 Life in Leuven is exciting and full of life, since a majority of the town is made up of young students like me. Recently, I’ve been lucky enough to show Leuven off to a number of my friends from the states who have come to visit. At the end of September two friends from Loyola who are studying in Alcala, Spain came for an overnight stay. They really lucked out because when they arrived it was sunny and in the low-70’s, a real fall treat here in Belgium. 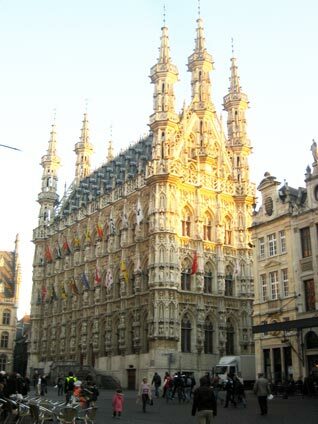 Leuven boasts the Stella Artois brewery and main offices of Anheuser-Busch In Bev, the world’s largest brewer group. The following weekend, three Loyola students who are spending their first semester in Paris came for a long weekend. While they were here we spent one day in Brussels and went to a chocolate making demonstration — so cool! I also ate the most delicious waffle topped with chocolate and strawberries. The next week I had yet another visitor… my best friend flew over from the States for a long weekend during her fall Pacing break. Sara and I met four summers ago when we both did a summer program at Cambridge University in England. It was so exciting to be back in Europe with her once again. We took at day-trip to Antwerp to do lots of shopping with two of the Belgian girls who live on my floor. We ate plenty of good food, drank lots of coffee, and she experienced her first Belgian beer (which I’m certain she thoroughly enjoyed!). I must admit it’s kind of weird to be all the way across the ocean—thousands of miles from my familiar surroundings in Wayne, yet to see so many of my friends from back home on a regular basis. It’s easy to forget how far away I really am when it seems half of the Main Line is right beside me experiencing these fantastic European cities and adventures! I regularly use Skype and call my parents; I also get weekly letters in the mail from my grandmother just like I did at Loyola. The transition to life in Europe has been incredibly smooth and I’ve been lucky not to be homesick at all. My first semester here is just over half-way done and I couldn’t be any happier that I have decided to be here for the whole year! There is just too much to see and do; I haven’t even made a dent in the list of places I would like to visit. These next few weeks will be incredibly hectic with lots of traveling but I’m ready for it. My most anticipated trip yet is coming soon – watch out Morocco! Mom and Dad, as always I miss and love you. I love this travel series, I am hanging on every adventure. Keep them coming, I will be abroad hopefully in 2 yrs time. We love reading all about your wonderful travels and we can’t wait to see you soon. We miss you so much….